Located in Southwest Montana about sixty miles north of the Idaho border along Interstate 15, Dillon is a town that seems much larger than it really is. Despite having a population of only 3700 people, the downtown area of Dillon is surprisingly large. Additionally, similar to cities much larger than Dillon, the shopping area also sprawls well outside of the downtown area, particularly at the Interstate 15 interchange. One reason for the larger size of Dillon is due to being the county seat, and primary business town, of Beaverhead County. Additionally, Dillon receives many visitors year-round due to its location along Interstate 15. Dillon is also home to Montana Western University. The downtown area of Dillon, in addition to being surprisingly large, is full of many restored or well-maintained historic buildings. The downtown is also a busy place, particularly during the summer months. Unlike many small towns, there are few empty storefronts in the downtown core of Dillon. One of the primary attractions in downtown Dillon is the Beaverhead County Museum, which is located inside the restored Dillon Depot. 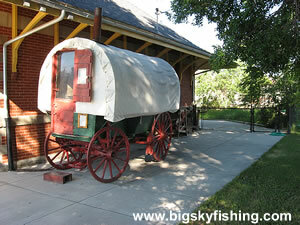 In addition to displays inside the museum, many outdoor exhibits are on display, including an old sheepherder’s wagon and an old log cabin. Dillon receives many visitors due to its excellent location for outdoor pursuits. Several excellent trout fishing rivers are a quick and easy drive from town, including the Beaverhead River, Clark Canyon Reservoir, the lower and middle sections of the Big Hole River and the Jefferson River. Several scenic drives are located within an hour of Dillon, including the Big Sheep Creek Backcountry Byway, the Pioneer Mountains Scenic Byway and the Centennial Valley Backcountry Drive. Due to its location along Interstate, Dillon has everything that a traveler will need. Several hotels, including the affordable Super 8, are located in town. The usual fast-food suspects are located near the Interstate, while the downtown area has many restaurants. Overall, I always enjoy visiting Dillon. 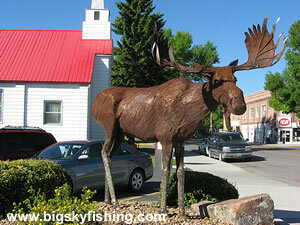 The town has an ideal setting for those who are fishing, camping or simply exploring in this part of Montana. Additionally, visitors should plan on spending a bit of time in the downtown area as well as visiting the very nice Beaverhead County Museum. Due to being the largest town on the Interstate for many miles around, Dillon has several hotels/motels. The Super 8 in Dillon, while not a luxury pad, generally has extremely reasonable room rates during the summer.